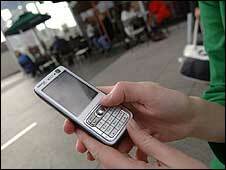 The cost of sending text messages from your mobile phone when you are overseas in the European Union has come down. The maximum charge for sending a text is now 11 euro cents ($0.15; 9.4p) plus sales tax. It is the first time that text charges have been capped. The previous EU average was 28 cents. The price of making a call is capped at 43 cents a minute, down from 46 cents, while the price of receiving a call is capped at 19 cents, down from 22 cents. "The roaming-rip off is now coming to an end," said EU Telecoms Commissioner Viviane Reding. The cost of transferring a megabyte of data is capped at one euro. Also, mobile operators have been forced to charge for calls by the second after the first half minute, instead of rounding up to the nearest minute. Many mobile operators have fought against the new caps, which are expected to significantly reduce their profits from roaming charges.